Chinese artist Han Bing will lead a public procession from Manchester Cathedral, through the city, ending at HOME. 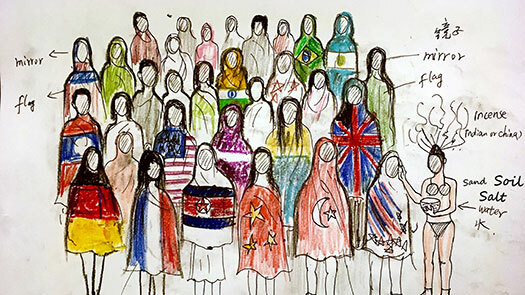 With each member of the procession wearing the flags of different nations worn draped around their shoulders, the artist addresses the question of how to smooth the conflicts between our individual identities and our role as a member of a community - or a citizen of a country - without erasing the differences that make us unique. As nationalist politics are on the rise across the world, Han Bing asks, who has the right to belong? And what must be erased or assimilated in order to become part of a collective? If you would like to be involved in the procession, we welcome you with open arms. Please email asiatriennialmcr@gmail.com with the subject heading ‘Smoothing towards Utopia’. You will need to be at the Cathedral by 2pm on Wednesday 10 October. Smoothing Towards Utopia is supported by the Confucius Institute at the University of Manchester.